The Surya is an interesting new development in the effort to get the cost of solar power down to a level where it will compete with fossil fuel generated power. The Surya is an inflated cylinder with a mirror surface along the mid-plane of the cylinder. The mirror is reflective plastic film that is shaped by a slight differential pressure between the top and bottom halves of the cylinder. 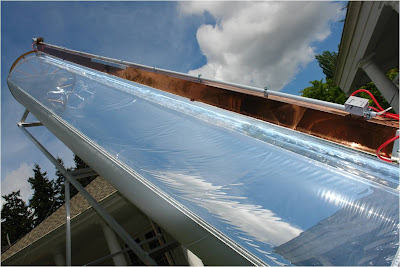 The mirror is shaped to concentrate light on PV cells that are mounted in a linear array along the outside of the cylinder (the brown box in the picture above). The Surya tracks the sun, so that it is always aimed to collect solar radiation efficiently. The idea is that the light weight and low cost Surya inflatable structure coupled with greatly reduced PV cell area compared to non-concentrating collectors can reduce the cost of solar generated electricity. As a further benefit, there is also the possibility of collecting thermal energy (heat) as a part of the cooling system for the PV cells. Mithra, the inventor of this project, is a friend and was a co-worker back at Boeing before I retired. 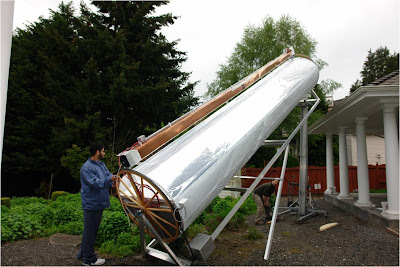 I helped Mithra with the building of the small scale prototype for the first version of the inflatable heliostat. I'm really impressed with this full scale prototype of the new design -- it really shows what a small, skilled team can accomplish without millions of dollars of funding. Hope this developed even more by now,Thanks for interesting information. I believe that there is a new prototype in the works that incorporates some significant design improvements. I'll do an update when I get more from Mithra. wow really beautiful and interesting project. is this created in India? the inventor name and the project name implies it is created in India , right?